Concrete removal, Grading, Soil Transport and More. All Services we provide will be done in a workman like manner and with quality workmanship. The Products we use are provided by local suppliers which meet or exceed the standards of local building codes. Ritsema Masonry & Construction also provides repairs to all of the above masonry products and more. Insurance and renovation work is welcome. Chimney Repairs can be done after a new roof is installed with no damage to shingles as we use carpet to protect the shingles. 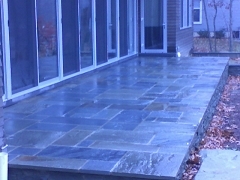 Random Blue Stone Patio. Masonry by Ritsema Masonry & Construction.